Job Responsibilities  Communicating with Transport Suppliers in order to obtain their services.  Coordinate with transport coordinators of remote sites in transport related matters.  Summarize transport details of sites and prepare overall company information.  To support in analyzing new and existing transport operations to identify right costs. Candidate Profile  A minimum of 3 passes at GCE A/L.  A Diploma in Supply Chain Management will be an added advantage. 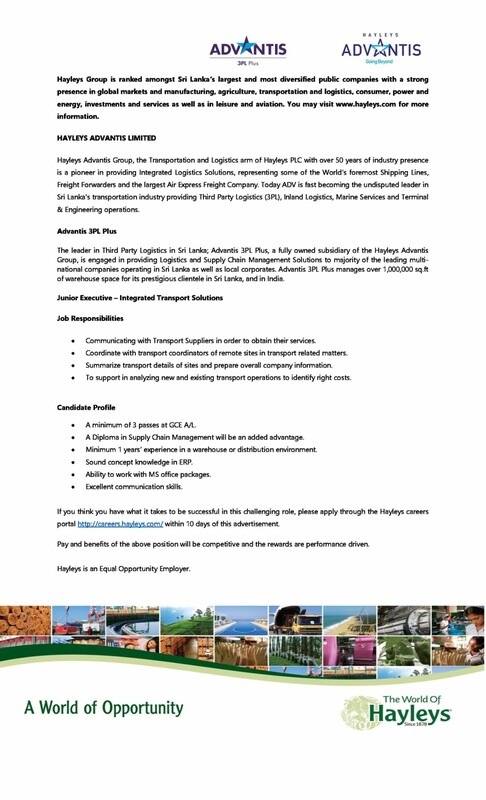  Minimum 1 years’ experience in a warehouse or distribution environment.  Sound concept knowledge in ERP.  Ability to work with MS office packages.  Excellent communication skills.